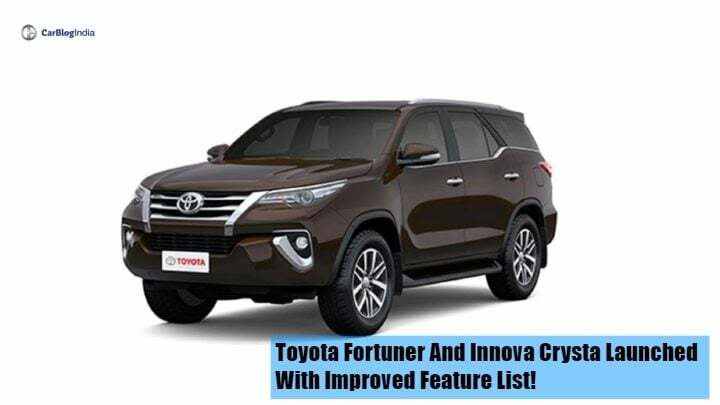 Toyota Fortuner and Innova Crysta have been launched with a new improved features list. With this, the prices of both the utility vehicles have increased, effectively. The Innova Crysta now starts from Rs 14.65 Lakhs and Fortuner starts from Rs 27.27 Lakhs (ex-showroom Delhi). Currently, Toyota Fortuner and Innova Crysta are Toyota’s most popular cars in the entire lineup. The Innova Crysta is an MPV, whereas the Fortuner is a full-grown SUV. While the Fortuner competes with Ford Endeavour and Volkswagen Tiguan, the Innova Crysta is the only MPV in its price range. So now, both the cars have received new features along with a mandatory third party insurance for up to 5 years. Now, emergency brake signal, rear fog lamps, LED front lamps and Anti-theft alarm with glass break and ultrasonic sensors are standard fitments. The updated Fortuner now starts from Rs 27.27 Lakhs onwards and the Innova Crysta starts from Rs 14.65 Lakhs onwards (ex-showroom Delhi). The Innova Crysta gets the standard fitments including the Emergency Brake Signal, Rear fog lamps, front LED fog lamps and more across all variants. The lowest variant GX 2.4 also get a touchscreen infotainment system, steering mounted audio controls, power-folding wing mirrors with puddle lamps and speed sensitive door lock/unlock feature. The Toyota Fortuner also gets the Emergency brake signal, Rear fog lamps, front LED fog lamps and more as standard fitment across all the variants. The full-grown SUV now comes with passenger side power seat and an electro-chromatic inner rear-view mirror. However, it still does not receive an Electric sunroof, which is offered even in much lower priced variants. The Innova Crysta is priced starting from Rs 14.65 Lakhs up to Rs 22.06 Lakhs. The Innova Touring Sport is now priced starting from Rs 18.59 Lakhs, which goes up to Rs 23.06 Lakhs. Both editions of Innova are priced around Rs 30,000 to Rs 64,000 more than the pre-updated ones. The Fortuner is priced starting from Rs 27.27 Lakhs up to Rs 32.97 Lakhs (all prices ex-showroom Delhi). 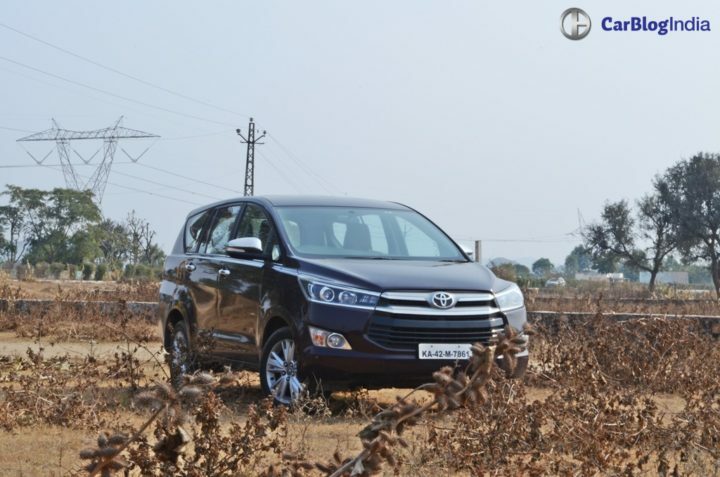 Currently, the Innova Crysta comes with both petrol and turbo-diesel engine options. The 2.7 Litre petrol engine churns out around 164 BHP of power and 245 Nm of torque. It gets 2.4 Litre and 2.8 Litre turbocharged diesel engine options. The 2.4 Litre engine produces 148 BHP of power and 343 Nm of torque. The 2.8 Litre diesel engine produces 172 BHP of power and 360 Nm of torque. The engine comes mated to a 6-speed manual transmission along with an optional 6-speed Automatic. Toyota Fortuner comes with the same 2.7 Litre petrol engine that delivers 164 BHP and 245 Nm. It comes with only 1 diesel engine; the 2.8 Litre diesel engine. This engine delivers 172 BHP of power and 360 Nm of torque. The Fortuner also gets the same transmission options. It also gets 4WD on the top-end variant.